Microsoft just released a new Windows 10 Insider build (Build 17682), with a lot of improvements. However, a great new feature for IT Pros is that RSAT (Remote Server Administration Tools for Windows 10) is now a feature on demand. You can now go to Windows Settings, Optional Features and select add features, where you then will see the different Remote Server Administration Tools for Windows 10 or Windows 10 RSAT. This means IT Pros do not need to manually download the RSAT tools to upgrade. This will safe most of us a lot of time. 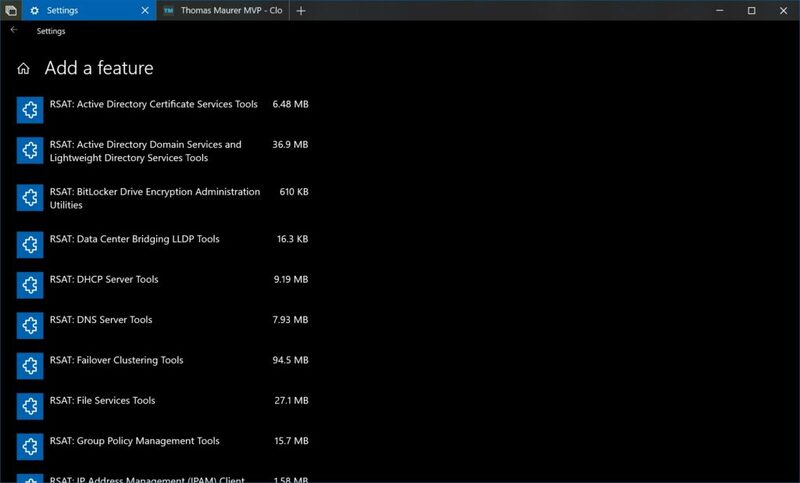 Remote Server Administration Tools for Windows 10 lets IT administrators manage Windows Server from a remote computer running the full release version of Windows 10. As mentioned you can use the Windows 10 Settings and add the feature using the UI, but you are also available using PowerShell. This feature is currently only available in the Windows 10 Insider builds and is likely to be rolled out to everyone with Windows 10 1809 later this year. Is it possible to download the cab files manually? I’d like to enable the RSAT features offline similiar to the .NET 3.5 feature. In VLSC it’s called “VDA 10 Features on Demand”, „Windows 10 Professional Features on Demand“, „Windows 10 Enterprise Features on Demand“ and „Windows 10 Education Features on Demand“. Wow… This is absolute insanity that MS would completely break such basic Windows functionality. It is no wonder that there’s a growing mistrust of Windows updates again.